Almost three years ago I conducted a simple experiment. I placed a balance pad under a horse’s hoof. I had no preconceived notion as to what might happen, but I was curious to find out. The results were so astounding that I have spent the past three years experimenting, exploring and refining what I now call the SURE FOOT® Equine Stability Program. During this time been exploring SURE FOOT with hundreds of horses, consulted with Dr. Steven Peters (co-author of Evidence-Based Horsemanship), conducted a pilot study with Dr. Hilary Clayton, discussed what is happening with numerous veterinarians including Dr. Joyce Harman and Dr. Rosemary Ganser (both of whom now recommend and/or use SURE FOOT when treating horses), Dr. Robert Bowker, professor at MSU and expert on horse hoof anatomy and other noted equine and human professionals, body workers, farriers and behaviorists. While no one can say exactly how SURE FOOT causes these clearly observable changes, it is obvious that there is something profound happening to the horses during the process, which has a long-lasting and/or permanent positive effects on behavior, self-confidence and performance. The first horse I experimented with was Dante. His owner had changed saddles the month prior. Unknown to her the new saddle was twisted and put excessive pressure on the horse’s right rear corner of the ribcage. This adversely affected the movement in his right hind leg. It was no longer coming through and the horse looked lame. We replaced the old saddle during the lesson but the movement did fully improve. That night I talked with Dr. Joyce Harman by phone. We were discussing insulin resistance and the idea of standing vs. sitting at the computer. Dr. Harman wanted to stand at her computer but needed something to stand on that was more comfortable than the hard floor. We began discussing how dogs are placed on unstable surfaces during rehabilitation from injury and surgery. I questioned her about doing this with Dante. Joyce knew Dante and suggested that he only stand on the balance disc for 15 seconds. The next day I took two discs with me to the arena and put one under Dante’s right hind hoof. After 10 – 15 seconds he walked off a different horse! Since then I have put countless horses on pads and, more importantly, there are people whom I have never met using SURE FOOT and who are seeing dramatic improvements in gait, balance, behavior and performance in as little as 10 seconds. I admit, if I had not been the one to discover this I doubt I would believe someone telling me that horses can change long standing behavior and movement patterns that fast. But having seen, shown and heard from horse owners of all breeds and disciplines I know these results are real. More importantly, SURE FOOT is simple to do and virtually impossible to do wrong because the horse is allowed to choose whether or not he wants to stand on the pads. One of the key tenets is that this is not training. It is something you offer to your horse just like when you go to MacDonald’s the clerk asks “would you like fries with your burger?” She is offering you fries and you have the option to say “yes” or “no”. In this way your horse isn’t required to stand on the pads or remain there for any specified length of time. He is allowed to refuse to stand on them, walk off, or stay as long as he likes. Therefore the horse dictates session. During a session you become the facilitator and observer, noticing how the horse responds, what he does and sensing how he feels after walking off the pads. These observations and sensations allow you to see your horse in a new way. You gain understanding because you discover the habitual postural and behavioral patterns that cause what you feel and observe when handling and riding your horse. Therefore, the process acts like a magnifying glass highlighting patterns and giving you new insights into your horse. In addition, the majority of horses let down, going from “fight and flight” to “grazing mode” and then dropping into an even deeper state of relaxation, in many cases appearing as if tranquilized. As a session progresses horses can be seen to close their eyes, ignore their surroundings, rock, sway and breathe deeply. The horses are quick to identify the person who brought them this level of comfort and seek out the pads. 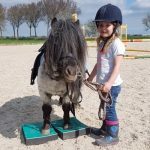 There are now numerous reports of horses coming up to their owners, when previously they would run away as well as horses clearly attempting to stand on the pads even when difficult to reach. SURE FOOT can address and resolve many of the balance issues horses incur when handled or ridden. Fundamentally, how that horse’s hoof meets the ground is how that horse meets the world. No matter the size of the horse, his relationship to gravity and the earth is dependent upon the way he stands and places his hooves during movement. Consider for a minute that your two feet cover more surface area than most horses hooves, yet they are supporting a significantly greater body size and mass. 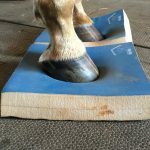 It is critical for those hooves meet the ground in a solid, secure way if the horse is to be confident and perform well. We call this trait “sure-footed”, something that was highly valued when our lives were dependent upon the horse for survival. The horse also has a significantly larger cerebellum, the part of the brain that regulates motor movement, than we do. Therefore, he learns through movement. Fortunately, more and more people recognize that good quality shoeing or trimming are essential aspects of good horsemanship and affect the way a horse moves. Some may argue that a barefoot horse is better off than one that is shod. 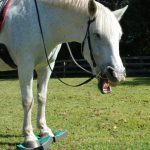 From my experience both have habits and there seems to be no difference in response between barefoot and shod horses in regards to response and changes that occur from standing on the pads. When we acknowledge and address the fundamental way the horse’s hooves habitually meet the ground the horse will change the way he moves. He will seek out, explore and choose something easier and more efficient as long as there isn’t an underlying issue of pain preventing him from making that change. Addressing the horse’s balance through that hoof/brain connection can often reduce or eliminate weeks and months of traditional training because the horse consciously chooses the easier path when he becomes aware of his inefficient patterns of movement and is given a choice. Moon Pie before (left) and after (right) one 40-minute SURE FOOT session. She consistently twisted her head at the trot the session. The next day there was no signs of twisting. Moon Pie had been a successful event horse leased to a teenager before she developed Lyme Disease. She returned to her owner, Cathy Gulick Sanders and was treated for Lyme but was no longer the fluid, confident horse of the past. She had a severe head twist trotting and difficulty cantering to the right and was beginning to stall weave, something she had never done before prior to illness. I had worked with Cathy and Moon Pie many times prior to her illness. But I had not seen her since returning to Cathy. We decided to use her for the SURE FOOT DVD with no expectation of the outcome. Moon Pie immediately took to the pads. At times she stood in such an awkward position it was hard to believe she could relax yet she breathed deeply, closed her eyes and was clearly enjoying the process. The session lasted about 40 minutes at this point we had pads under all four hooves. The next day I had to recruit Cathy for filming another DVD at a different location. When Cathy brought Moon Pie into the barn to prepare her for the trip, she was calm and relaxed, no signs of stall weaving. She trailered well and when I saw her I was amazed. Gone was the head tilt, awkward movement or any signs of the way she moved the previous day. Her canter was round and uphill with no assistant from Cathy, who was busy doing exercises for the camera. I had a hard time keeping my focus on Cathy the horse was moving in such an elegant way. Moon Pie was restored to her previous way of going in one session. In this case my guess is that she was reminded of how she used to move, which had been covered up by the newer pattern from the Lyme disease. Regardless of the pathway, this horse, instead of becoming a lawn ornament, is now a useful, confident partner. Fluffy and her owner Jennifer Hargquist were in my Five Minute Fixes Demo at Equine Affaire, MA in November 2014. After they entered the arena the roll down door dropped scaring Fluffy. She was spinning around, rearing and plunging while Jennifer was trying to regain control. I saw the situation and, having my pads with me, walked over asking if I could put one under Fluffy’s hoof. The audience was packed with approximately 200 hundred people and I had never done SURE FOOT in this kind of environment. I had no idea what would happen. I placed Fluffy’s hoof on the pad and within 5 seconds she dropped her neck and took a breath. She stood on the pad for a few seconds and walked off completely different from the drama moments before. I put pads under her feet for a few more minutes before asking Jennifer to mount. I continued having Fluffy stand on the pads and walk off for a few minutes before proceeding to do my Fixes demonstration. By this point Fluffy was relaxed and responding to Jennifer. I had three riders in a small arena and an “L” shaped bleacher situation so my attention was focused toward the audience. However, behind my back Fluffy went over to the pads, which were up against the rail every time she went past them. Jennifer allowed her to seek out the pads. She worked herself into position to get one hoof onto a pad. As the demo progressed Fluffy managed to get both front feet on the single pad! Clearly this horse recognized and wanted the comfort the pads offered her! I was completely upstaged, as the audience could not take their eyes off this little horse who became the talk of the Expo. Madison is owned by Ri Ferguson. She came to the Maryland Horse Expo in January 2015 and was a rider for my SURE FOOT demonstration. I had never seen either the horse or rider before that moment. Madison was angry. For as long as they have owned her she would pin her ears whenever another horse or person came up or passed her. She was defensive, tense and particularly unhappy about a gray pony that was also in the arena. Ri would get nervous when Madison became too aggressive toward horses because she would attempt to bite those around her. I began with a firm (green) SURE FOOT pad under one front hoof. The mare was distracted and agitated so she did not stand for very long. I quietly pursued allowing her to move off whenever she needed to without attempting to constrain her in any way. At one point her behavior escalated and Ri could feel the confusion in her body movements. Ri became worried and asked to dismount. I gave her permission and we continued using the pads while she held Madison. The mare began to show visible signs of letting down. Her face softened and she would stand on pads under each front feet. I asked Ri if she was willing to remount and she did. We allowed the mare to walk whenever she needed while I continued to place a variety of SURE FOOT pads under her feet when she was standing still. When we got a pad under all four feet it was extremely evident how much heavier she stood on her right front (evidenced by the dent in the pad). But once she stood on all four pads she began to sway as so many horses do when using SURE FOOT. The mare softened, her eyes began to close and, if the pony had not been such a source of distraction, she would have ignored her surroundings. We ended the session at that point. The next day Ri came to my booth and told me that for the FIRST time, they found Madison lying down asleep in her stall Saturday afternoon. And that Sunday morning, during the Parade of Breeds, instead of constantly pinning her ears, she only did it once. The changes were so significant I asked her to return to another demo I was giving so that we could put her on pads again. Madison arrived on halter and lead. We placed pads under all four feet moving up to the more advanced pods under the front feet. This time she was more heavily weighted on the left front foot. Again she swayed and looked as if she would fall asleep. On Monday I got an email from Ri. Madison is a “changed horse!” Her aggressive, defensive behavior, which she has exhibited for years is now gone. To get started with SURE FOOT for your horse, please click here.